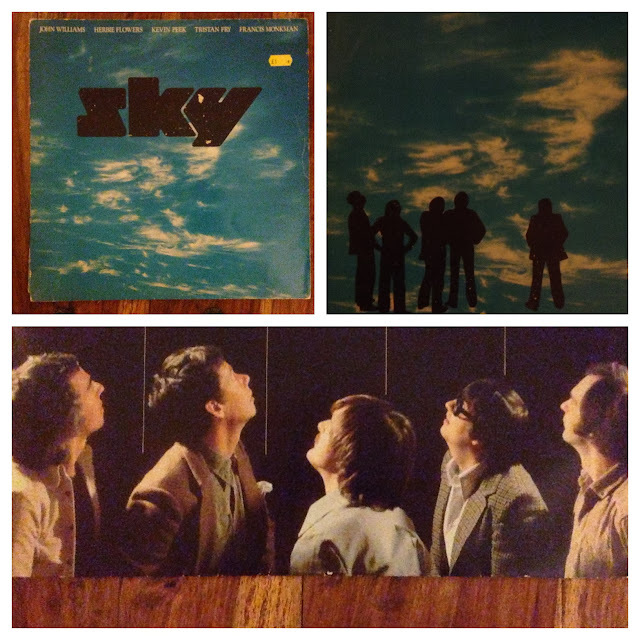 I picked up Sky's self-titled debut for £1 earlier in the week. This wonder of instrumental progressive rock was found languishing in the clearance section of Missing Records. I snapped it up without further thought. I wasn't disappointed. John Williams (not the Star Wars soundtrack composer) is a gifted guitarist, one I was vaguely familiar with from his track "Cavatina" from The Deerhunter. I was curious how his band sounded and can honestly say I am impressed. The first thing that grabbed me about this album was how each musician within this incarnation of Sky was accomplished in their own right - Francis Monkman (keyboards), Herbie Flowers (bass), Tristan Fry (percussion) and Kevin Peek (guitars) - all contribute musically to the Sky sound ... this isn't John Williams plus band. The next thing that I liked was their sound ... it is uniquely theirs. A mix of classical and rock, one that is more progressive than symphonic. Their version Erik Satie's "Gymnopedie No. 1" is a delight. I am glad I picked up this album and would highly recommend it to anyone with a fondness for instrumental & progressive music.